On June 23, 2017, Haus der Kunst opened Frank Bowling: Mappa Mundi, a comprehensive survey of monumental and mid-sized paintings by the distinguished Guyanese-born, British painter Frank Bowling. It may be asked: Why the "Black Atlantic" now, in the discourse of the visual? How might the visual, through the insistent aesthetic, formal, and theoretical lens of art offer us a sense of the renewal and interest in Black Atlantic cultures and the cosmopolitan variants of critical practice that it has engendered? In recent times, artists ranging from Sonia Boyce, Ellen Gallagher, Isaac Julien and Steve McQueen have produced works that intervene in this diasporic critical space. Likewise, theorists such as J. Michael Dash and David Scott continue to examine questions surrounding the Antilles and the Caribbean as active sites of philosophic imagination. The goal of this symposium is to examine the intersection of the artistic, theoretical, literary, and cultural dimensions of Bowling's practice. 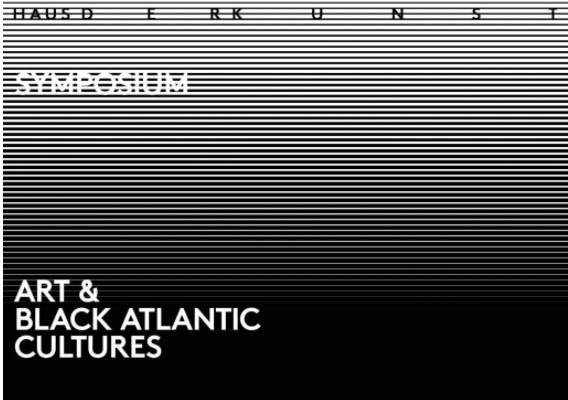 Over the course of the symposium, the invited participants, ranging from artists to literary scholars, cultural theorists, and art historians, will bring into sharp focus the ways in which the "Black Atlantic" continues to inform the production of art today by a new generation of artists, in connection with Frank Bowling: Mappa Mundi. J. Michael Dash, Professor of French Literature, Thought and Culture (New York University): "L'ivresse du sensible: Reading Surfaces with Edouard Glissant"
Courtney J. Martin, Deputy Director and Chief Curator (Dia Art Foundation, New York): "They've all got Painting: Frank Bowling's Modernity an the post-1960 Atlantic"
David Scott, Professor and Chair of Anthropology (Columbia University, New York) and President of Small Axe Inc.: "The Archaeology of Ourselves"
Travelling Light: Re/figuring the "Black Atlantic"
Sonia Boyce, artist, London: "From the Substrate to the Riverbed"
Ellen Gallagher, artist, Rotterdam and New York: "Are we Obsidian?" Ticket sales under www.hausderkunst.de or at the museum's front desk. With thanks to ICF International Curators Forum for the support of the symposium. Additional thanks to an anonymous supporter and David A. Bailey.